Thanks to our sponsor August Home, we’ve got an exclusive deal saving you big on an August Smart Lock Pro + August Connect Wi-Fi bridge and August’s physical Smart Keypad accessory. Get the entire bundle now for $279 (Reg. $358). Get August Smart Lock Pro + August Connect Wi-Fi Bridge & Smart Keypad $79 off for $279 (Reg. $358). Head below for our video walkthrough with August’s Smart Lock Pro and the recently released native Apple Watch app and HomePod support now available for the HomeKit-enabled lock. August Smart Lock Pro has quickly become one of the most popular HomeKit smart locks on the market, but recently it gained even more functionality for Apple users with a new native Apple Watch app as well as HomePod support a couple months back. As you’ll see in the video above, on average the August Smart Lock takes less than 10 minutes for installation and it utilizes your locks current deadbolt and handles to blend it with your current setup and design aesthetics. With both the new native Apple Watch app and the recently introduced support for Apple’s new HomePod, you can now use both devices to unlock and check lock status of your door without having to reach for your iPhone or even have it nearby. This is especially handy for the many users that might take their Watch for a walk or run outside without bringing their iPhone. 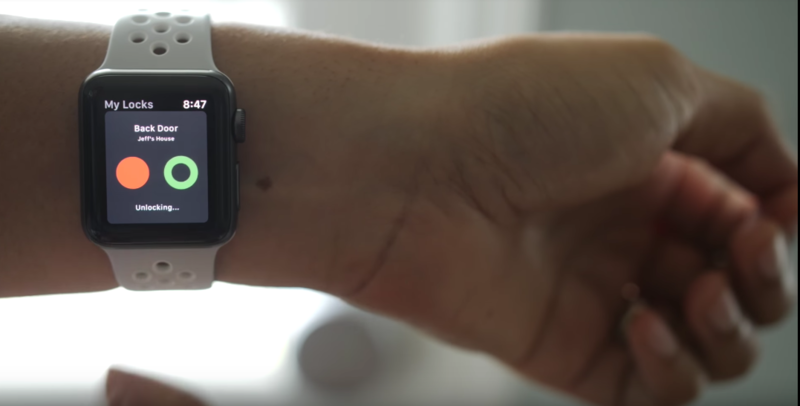 The native Apple Watch app is also accessible by anyone who is set up as a house owner in your August account, so your family members and others can also have access without their phone or keys. The HomePod support will be especially useful for hands-free support around the house as well as for those that use Scenes often. For example, including it in a goodnight scene to lock the doors via HomePod. The August Connect Wi-Fi Bridge included in our bundle above gives you Wi-Fi connectivity for remote access via any of the supported platforms including Amazon Alexa, and Google Assistant. Also included in our exclusive discount is the August Smart Keypad, a physical keypad that you can optionally have outside of your door for keyless entry even without your smartphone or Apple Watch. It is wireless and runs off two AA batteries, and is therefore easy to mount to an exterior wall without any wiring required, making installation a matter of minutes. Get August Smart Lock Pro + Connect Wi-Fi Bridge & Smart Keypad $79 off for $279 (Reg. $358). In case you missed it, we’ve been giving away the August Smart Lock Pro bundled with Apple’s new Product(RED) iPhone 8 to one lucky ready this month. This week is your last chance to enter.